For some time the members have already passed the thousand (more than 1,450) and the number is set to increase considering that the weather should be forgiving. In Verbania today begins the goings of athletes for the Lake Maggiore half marathon, one of the most attended sporting events of the VCO, which on Sunday morning between 11 and 14 will bring athletes from around the world to challenge the stopwatch on the scenic road that connects Verbania in Stresa. Three Kenyan debutants sign an extraordinary lap time race.On Lake Maggiore one of the fastest races ever in history.It is Sunday 11th Nexia Audirevi Lake Maggiore Half Marathon, Fidal competition all on the spectacular shores of Lake Maggiore, a wonderful and fast trip from Verbania to Stresa for over 1500 athletes engaged in both the half marathon of 21,097km that the 10km which is taken by Verbania Fondotoce. There has always been talk of a flat and fast path, ideal for great time performance and in these statements so much truth.In fact, it was a record-breaking race, one of the fastest ever in Italy, the third best time ever scored in our country on an official and certified half-marathon route. The race set up by Paolo Ottone as President of Asd Sport Pro-Motion was extraordinary and of sublime technical rate, a dream that comes true after 11 years.Actors starring three new Kenyans on the 21.097km that have raced with a record pace.As we had planned on the eve of these athletes often reserve the best surprises and this happened today.Vince and the race record is the number 11 Daniel Kipchumba who falls on the finish line of Verbania in 59'06 "after a sprint with the other rookie Mangata Kimai Ndiwa who closes with only one second of delay in 59'07".For them a show pass at 10km, a 27'48 "that already made big things dream.Third place for the third rookie of the day that completes a very valuable podium, Josphat Kiptoo Boit in 59'19 ". 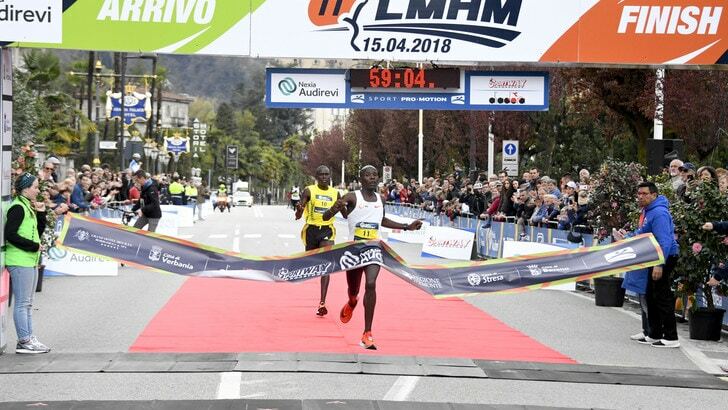 First European is the Swiss Fabian Anrig in 1h08'12 "while the first Italian is Francesco Grillo in 1h10'06"
Excellent international level and certainly one of the fastest in Italy for this 2018 is the women's race.In this case, for the Kenyan Daisy Cherotich in 1h09'44 ", she too has pulled out the rabbit from the cylinder today, signing an excellent performance.Second place for compatriot Leonidah Jemwetich Mosop that with 1h10'26 "goes very close to his personal record on distance, while bronze medal for the long-awaited Swedish Charlotta Fougberg, a multi-champion on the track in 3000 hedges and today the debut in half marathon.For her 1h11'58 "today between Verbania and Stresa, time trial that shows how much stuff there is for this girl, maybe just next year could come back to get under the wall of 1h10 '.Fifth the Italian premiere in Debhora Li Sacchi in 1h25'01 ". The path of the 11th NEXIA AUDIREVI Lago Maggiore Half Marathon is of the "Point to Point" type of. The route runs along the coast of Lake Maggiore that connects Stresa to Verbania allowing you to enjoy the panoramic view of the Alps and the unique beauties of the Borromean Islands.Architectural monuments surrounded by the crystalline waters of the lake.